EK Rotarians David Brown, Archie King and George McGraw accompanied by their wives, Gail, Enid and Frances represented the Club at the Stranraer Rotary Club's annual AmAm gold competition. They were joined by EK resident Jean Brennan, Gillian Monteith and Alan Thomson from nearby Dunskey Golf Club to make up two mixed fourball entries - possibly a first for the Club? Despite the fact that Gillian recently won the Southwest of Scotland Women's Championship, neither team were able to feature among the prize-winners. Gillian's team managed to finish ten shots behind, on a better two ball score of 134, 6 shots under par. David's team were slightly further adrift, losing the EK £1 challenge. 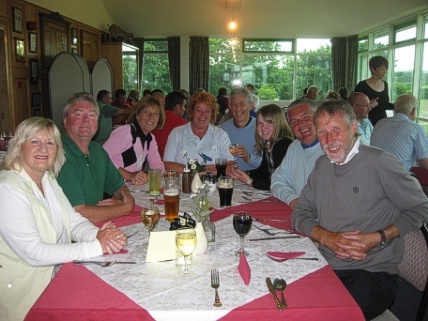 After the prize giving both EK teams stayed on at the clubhouse to enjoy the "craic" with Stranraer Rotarians . The visit cemented a relationship between the clubs which started at the District Conference in Perth two years ago, and will hopefully continue with a curling challenge later this year. in windy conditions which made scoring difficult. The winner of the Stableford competition with 36 points was Archie King; second with thirty three points and the better inward half was George Gunn; third was George McGraw with thirty three points. Other members playing were Jim Anderson, Jim Moretti Jack Blackwood and Ian Wiseman. 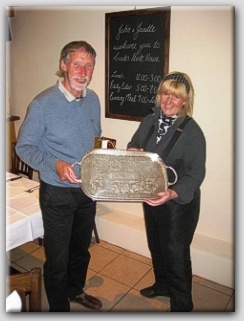 The party retired to Cooks Steakhouse for a meal, and were splendidly hosted by John and Janette McKie before Janette presented the prizes. See picture No.1 Picture shows the contestants. 17th December 2010 was the last meeting of the year and has is now became the Clubs Table Top Curling competition. Eleven members took part in the annual Christmas competition which started with a four team warm up event won by David "The Draw" Brown and Roddy "The Rock" Shanks who won all of their games in the round robin competition. After sufficient "warming" (about three rounds) the main competition started with some fairly "unwarmed" latecomers joining the fray and swelling the entry to five teams. Once again it was a league competition, that had a "nail biting" conclusion, not being decided until the last stone of the last end. Even then two teams ended up with five points out of eight, and the result was only decided on a shots count back, with Ray "The Random" Porrelli and Leslie "the Laser" Irvine overcoming Frank "The Fumble" McLuskey and George "The Gin" McGraw. Apart from "The Fumble", the evening broke up about seven o'clock with all the participants sufficiently "warm" to face the arctic blast outside. The "warming" was considerably helped by an unknown benefactor who dropped £20 on the floor and did not reclaim it before it went in the kitty. Footnote: Having not realised he had lost £20 until the following day, Roddy "The Rock" has now been renamed as Roddy "The Round" Shanks !! Perhaps the other competitors will reward his generosity? 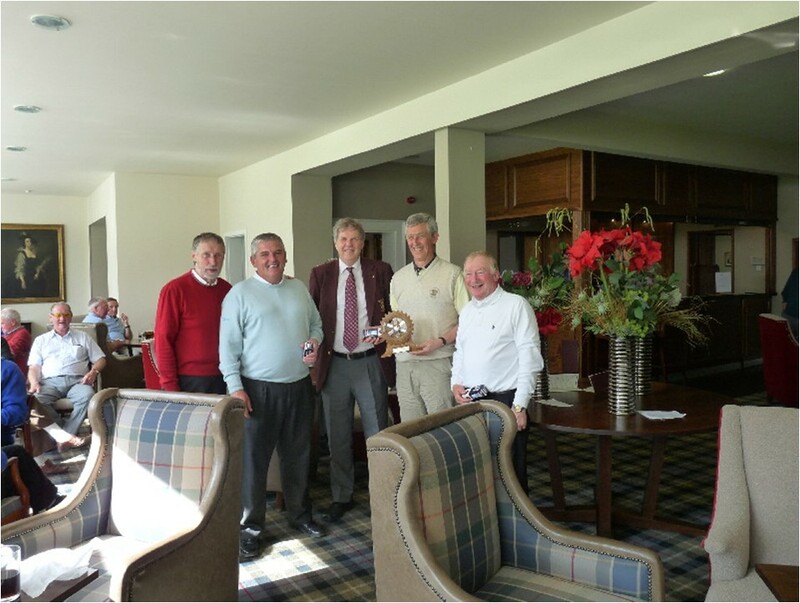 The annual Rotary District 1230 golf competition was held for the second time on the banks of the River Allander at Buchanan Castle Golf Club on 9 June. Fifty two Rotarians representing eleven clubs from the District only had to fend off stiff breezes, with the expected waterproofs not required. This weather may have resulted in slightly higher scores but the competition was still keen with the first three teams in the better ball pairs scoring well under par. 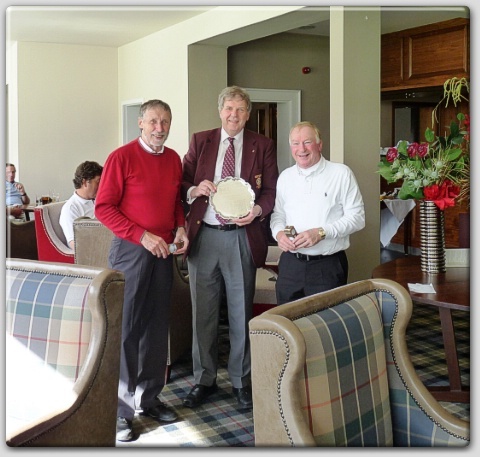 Leading the way in the Willie Stott Plate competition with 62 shots were East Kilbride Rotarians Jim Moretti and Archie King followed by one of the six Oban teams with the same score. In third place with a score of 63 shots was the second East Kilbride pair of David Brown and George McGraw. With a combined score of 125 shots East Kilbride Club completed the double, winning the Coronation Trophy and beating their nearest rivals, Oban, by five shots. This was only the second time in fifty eight years that both trophies had returned to East Kilbride, but it was a first for the East Kilbride Club, their daughter club East Kilbride Kittoch being the winners in 1987. District 1230 Governor, Ian Mills, presented the prizes and thanked the members Allander Rotary Club for a splendidly organised competition. East Kilbride's Sports Officer, George McGraw, also recognised the tremendous effort made by the Allander Rotarians, and hoped that all those attending would return in June 2012 when the East Kilbride Club would have the onerous task of matching Allander's organisational skills.